1. Preheat oil to 350 degrees. Combine 1/2 cup oil and egg; beat well. Add remaining ingredients except oil for frying and stir until well blended. 2. Dip shrimp into batter to coat. 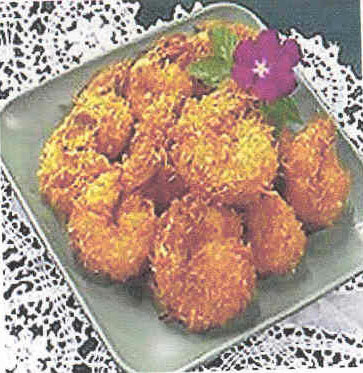 Drop shrimp into hot oil and fry for 30-60 seconds or until golden brown. Remove with slotted spoon; drain on paper towel. 1. In a large stainless steel bowl, combine all ingredients except crab meat and bread crumbs. 2. Using gloved hands, gently mix in crab meat, then add bread crumbs. 3. Spread a thin layer of plain bread crumbs on work surface. 4. Form crab mixture into equal balls, approximately 2" in diameter. Place on crumbs. 5. Gently flatten ball of crab mixture and round the edges. Form cakes about 1/2" thick and 3" round. Refrigerate. 6. In a sauté pan, melt 2 tablespoons of oil until hot. 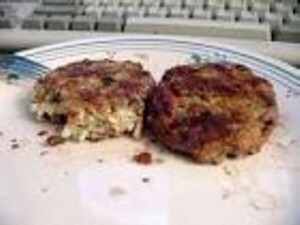 Gently slide in crab cakes 2 at a time. 7. Brown on one side approximately 2 to 3 minutes. Turn and brown on the other side. Turn down heat to simmer and cook crab cakes another 5 - 8 minutes.